We are all in France, during the Great War, and are fighting the Germans from our trenches. They are about half a mile away from us across an area we call "no mans land". We have been fighting now for over four months and we not gained an inch of ground at all. It is cold and wet here, very muddy indeed and the place is crawling with rats. 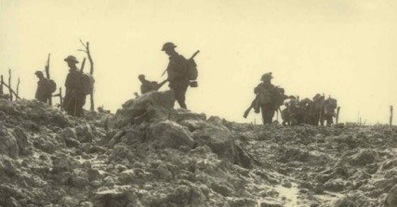 Every day we are ordered to get out of the trenches, to run across "no mans land" and kill the Germans if we can. Very often we meet the Germans coming the other way towards us, and thousands are killed every day from both sides. We just can't seem to get to their trenches, and they can't get to ours, too many are being killed before we can make up any ground. Today is Christmas Day and everywhere seems very still and quiet. Very strange. We can hear the Germans singing "Stille Nacht", Silent Night. We sing our version and then we hear the Germans applauding us!!! Its Christmas Dinner time and there's been no fighting yet!! After dinner we hear "Stille Nacht" again and we look above the trenches to see the Germans coming towards us, singing Christmas carols!! Great!!! So we all dive over the top and go to meet them, singing our own Christmas carols. They've got small presents for us, we gave them some too in return. They are not so bad really!!! They have families too, and girlfriends. One of them had a football so we played a great match in "no mans land" till it got dark. We said our goodbyes, waved to them, and went back to our respective trenches. St. Stephens Day. It was a good day yesterday, we had a good laugh. Today the Sergeant Major ordered us over the top again, but we refused, can't kill our mates. We heard some shouting and arguing from the German trenches, seems like they refused to fire at us too. We are all on a charge now, and are to be removed from the trench. 27th. December. We are all in prison now, refusing to carry out orders to fire on our friends. How could we do that after Christmas Day? 28th. They have put a new regiment into the trenches and the fighting is starting up again. Hope we get out of this Military Prison soon. This is a TRUE story, one of many documented by soldiers in the trenches on that day in 1914. Note: In 2005 this story was made into a film entitled "Happy Christmas" (1hr. 45mins.) and starred David Suchet. It is Parental Guidance age 12. It was distributed by Sony Pictures Television International and was shown on BBC 2 on Monday 22nd. December 2008. I don't know if this film is on general release on DVD. The film is a very moving and poignant reconstruction of true events leading up to, and after, Christmas 1914 in the trenches along the Western Front. "CHRISTMAS EVE, 1914, AND NOT A SHOT FIRED. THE GERMANS ASK TO PLAY FOOTBALL AND HAND OUT DRINKS AND CIGARS. THEY ARE EAGER TO SWOP ALMOST ANYTHING FOR OUR BULLYBEEF." It was possibly the most poignant moment of the Great War - when for a short time, the killing stopped and foes became friends, playing soccer instead of firing guns. The famous "Christmas Truce" of 1914 became etched in the in the memories of all who experienced it - including Regimental Sergeant Major Beck, who chronicled the event in his diary. Now his account of this brief interlude of peace in the trenches of the Western Front has come to light - a vivd, if matter-of-fact, narrative summed up by one graphic entry; "Not a shot was fired." The much-decorated NCO wrote about the British and Germans singing together, exchanging gifts and playing football in no-man's-land. He also described how a German band struck up "Home Sweet Home" and "God Save The King." He said the music 'sounded grand and made everybody think of home.' The Army also used the ceasefire as an opportunity to retrieve the bodies of some of their fallen comrades from no-man's-land. His account revels that the truce was, for the most part, observed for several days afterwards - the two side apparently reluctant to fire on the men they had met face to face. RSM Beck, of the Royal Warwickshire Regiment, survived the war and passed on his diary - beautifully handwritten in pencil in a ruled notebook - to his family. It has finally been made public after his granddaughter decided to loan it to her local history centre. RSM Beck was 34 years old and a veteran of the Boar War when he spent Christmas in a trench near the Belgian village of St. Yves, near Ypres. His diary entry for December 24th. reads: "Point 63, a quiet day. Relieved 2 Royal Dublin Fusiliers in the trenches in the evening. Germans shout over to us and ask us to play them at football, and also not to fire and they would do likewise. At 2am. (on the 25th. December) a German band went along their trenches playing Home Sweet Home and God Save The King which sounded grand and made everyone think of home. During the night several of our fellows went over no-man's-land to the german lines and were given drink and cigarettes." "25th. December - Trenches at St. Yves. Christmas Day. Not one shot was fired. English and German soldiers intermingled and exchanged souvenirs. Germans very eager to exchange almost anything for our "Bully Beef" and jam. Majority of them know French fluently. A few men of the regiment assisted in burying the dead of the Somerset Light Infantry who were killed on 19.12.14. Fine frosty day. Very cold." "26th. December - Trenches St. Yves. Unofficial truce kept up and our own fellows intermingled still with the Germans. No rifle shots were fired, but our artillery fired a few rounds on the Germans 3rd. and 4th. lines and Germans retaliated with a few rounds on D Company's trenches. 2 wounded." "27th. December. Trenches St. Yves. No sniping. A few "whiz bangs" on D Company's trenches. 1 wounded." On December 30th. RSM Beck receives a rare treat - a bath and a change of clothing as he and his men move on to La Creche. The soldier, who won the Military Cross and the Distinguished Service Medal, and was twice mentioned in despatches, joined the regiment as a private in 1808 when he was 18. Within a year he was fighting in the Boer War in South Africa and at the outbreak of the Great War his regiment was sent to France. By that time, he was Quartermaster Sergeant and he started to keep a diary. He was gassed at least once, and his death at the age of 48 may have been partly caused by the damage the mustard gas did to all those who survived it. In his early entries, he describes the novelty of seeing aeroplanes for the first time and mentions the wounding of a Lieutenant Montgomery on 13th. October 1914 - the officer who would become Field Marshal Montgomery of Alemein. After the war RSM Beck settled down in Portland, Dorset, having married local girl Eliza Jane Attwool in 1907. He died in 1928 and was buried with full military honours at St. George's churchyard, Portland. His granddaughter, Caroline Milverton said: "I decided to give the diaries to the local history centre because i felt other people ought to be able to read them. I never knew him, but I remember my Grandmother and she said that the War had changed him. I gather he was a very decent, honourable man." The diary is now on permanent loan at the Dorset History Centre.